Last month, Lord Martin Rees, the president of Britain’s Royal Society and “astronomer to the Queen of England”, hosted the National Science Academy’s first conference on the possibility of extraterrestrial life, which was attended by such scientific illuminaries as physicist Paul Davies, SETI founder and astrophysicist extraordinaire Frank Drake. And the resulting sound bite of the week is “World-Leading Physicist Says ‘They Could Exist in Forms We Can’t Conceive'”? Really? That’s it? That’s news? That’s what we get from the world’s leading thinkers on cosmology? Sorry for my tone, but it’s about time these guys got caught up with science fiction writers from 50 years ago. Check out a 1959 movie called “Invisible Invaders.” Or at a minimum, take Carl Sagan’s brainchild from the late 70’s, “Contact” (film treatment in 1979, book in 1985, and movie in 1997) featuring a highly advanced extraterrestrial race who can appear to us in any form they want. I’m sure there were many other writers who considered that a civilization advanced enough to cross millions of light years of space, might be advanced enough to learn how to cloak. I certainly pondered that idea as a kid. No doubt, these guys are a bright bunch. But not necessarily seeing the forest for the trees. Take SETI, for example. We tend to assign attributes of our own civilization and our own values to other potential civilizations. But there is really no reason to assume that once life forms on a particular planet that it will evolve into a life form that is eager to communicate. One could argue that the intelligence of dolphins, elephants, and humans are roughly equivalent (turn the clock back 50,000 years and look at what we assume about the behavior of each species; is there much difference?) We don’t see dolphins building SETI dishes. Using Drake’s own equation for counting the number of ET civilizations that we might be able to communicate with, we need to consider the duration of a civilization communicating with electromagnetic radiation in the radio spectrum. One can make the assumption that it might be similar to ours and in the range of 50-100 years. But this is a big assumption. Maybe ET modulates magnetic fields, or seismic waves, maybe they got fully wired for broadband internet before discovering radio wave propagation, maybe they communicate via telepathy, or entanglement, or some form of communication that is completely unknown to us. Expecting them to have a period of radio wave technology that just happens to overlap ours is probably quite unlikely. 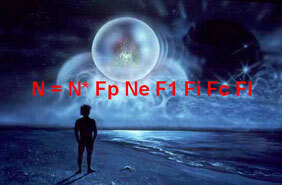 When I made reasonable assumptions for the factors in the Drake Equation in my book “The Universe – Solved!“, I got the result of .08 overlapping radio wave civilizations per galaxy, making it unlikely that SETI will find anything before funding dries up. On the other hand, modifying the Drake Equation to estimate the likelihood of ET visitation, I came to the following conclusion: If 50% of intelligent life forms can make it to Type III status, there should be thousands of migrating/colonizing/traveling species in our neighborhood. On the other hand, would they even care about us? When we take a walk through a field, do we attempt to communicate with the ants in an anthill? If the field is ready to be leveled in order to make room for a housing development, do we attempt to save the ants? No. Why not? Because they are so far beneath our intellect level or our perceived level of net worth, that such endeavors are simply not worth our time. Now imagine what a Type II or III civilization might be like. Consider how far we have progressed (some might say, regressed) as a society since the hunter/gatherer stage of human evolution 10,000 years ago. Further, consider that we are accelerating in this progression exponentially. So, for all practical purposes, it is impossible to even imagine where we might be in 10,000 years. Telepathic communication, control of time and space, simultaneous access to parallel universes, full merge with AI? Some futurists predict these things in hundreds of years, not 10,000. Furthermore, since 100 million years represents less than 1% of the lifetime of our galaxy, it is not unrealistic to assume that Type III civilizations may be 100’s of millions of years advanced compared to our own society. Given the foregoing discussion, it is easy to make an argument that it is highly unlikely that ETs are zipping about in our atmosphere in vehicles that appear to be no more than 50 years ahead of our technology (they supposedly crash, after all). The only possible “True ET” explanation is that extremely advanced species either intentionally appear in a form that makes us realize that they are here (not unlike the father figure in the Carl Sagan movie “Contact”) or they don’t appear to us at all. The above section was taken from my book and written in 2007.